Check out the latest Goddess Provisions News on My Subscription Addiction! Goddess Provisions Limited Edition Yoni Box -Available Now! Goddess Provisions Limited Edition Yoni Box + Spoilers! Goddess Provisions Limited Edition Crystal Box + Spoilers! 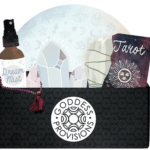 Goddess Provisions Ready to Retrograde Limited Edition Box + Spoilers!